I love my husband more than anything. And so I poured my heart and soul into making him a birthday cake with style (just like him). This is the result of that love and hours of work. 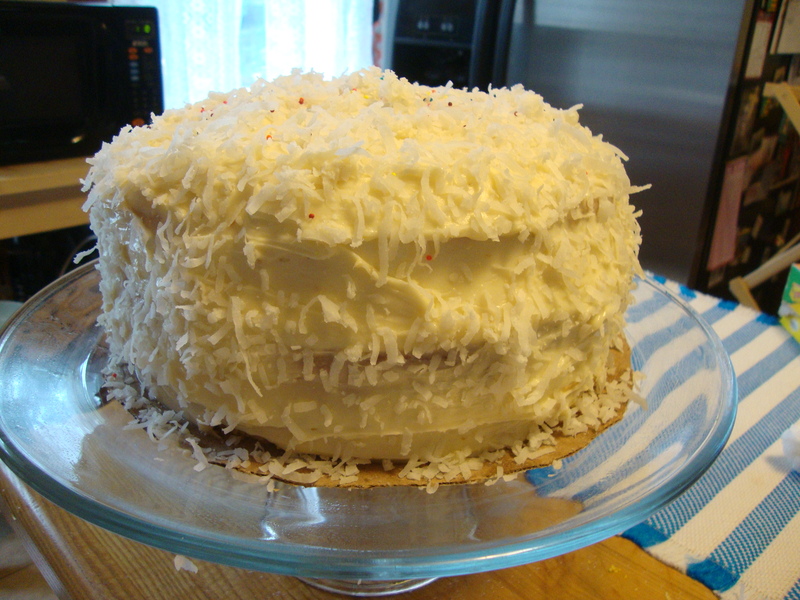 Make this cake when you want to impress someone. I had it last Christmas at my Aunt Zoe’s house and was blown away. 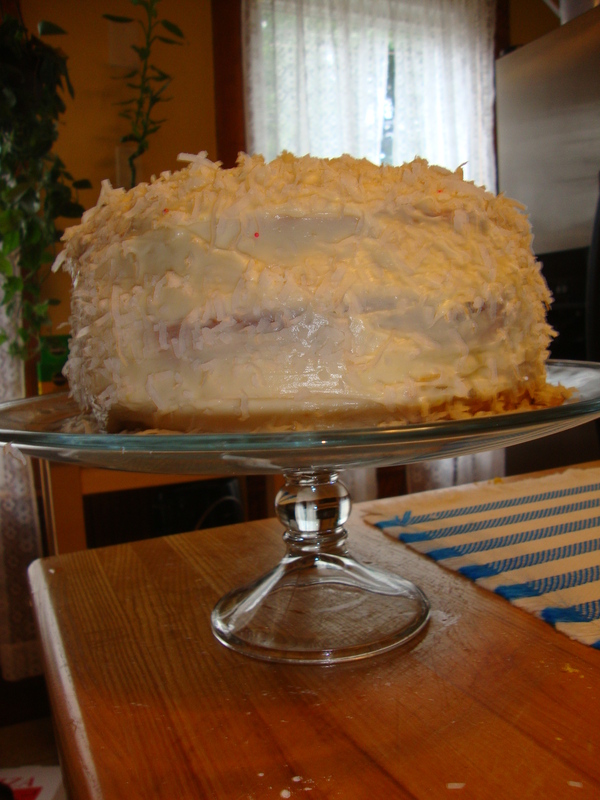 She shared this recipe, which she photocopied from America’s Best Recipes, with me. I did everything in one morning, however, when I do this again (someday) I think I will make the cakes a day or two ahead of time so there is less work all at once. You can always freeze cake too. If you have someone competent in the kitchen who could assist that would help too. This recipe makes a large cake. The recipe says 12 servings. I think we had even more than that since we don’t cut huge slices. The recipe also claims to only take a little over an hour. With clean up and everything it probably took me closer to 2.5 hours. 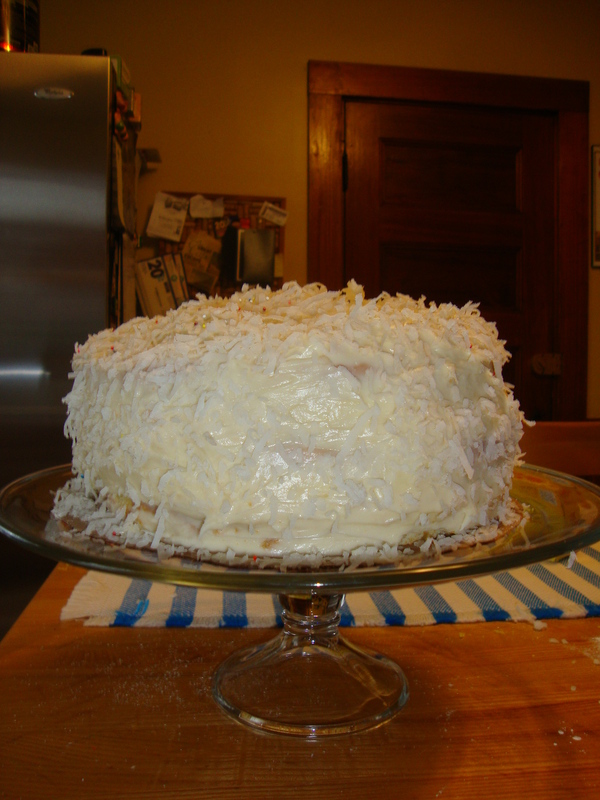 Of course I was working slowly and had never made a layer cake before. I stopped a few times to Google tips. Please note I have some advice in step 3 to avoid breaking a cake. The string of expletives that came from my mouth when one of my cakes broke would have shamed a sailor. It was fixable, thank goodness, and no one ever knew. I have a lot of photos to help with the process. In the steps below refer to each section of ingredients for the amounts. I ended up having some egg whites leftover and saved them in my fridge for an omelette. (even if you don’t make this cake I would make this frosting for sure. I shared a large slice with my colleagues and one told me “this is perfect cream cheese frosting.” Which made me happy. other garnishes could include gumdrops or sprinkles. 1. Prepare the Cake Batter. 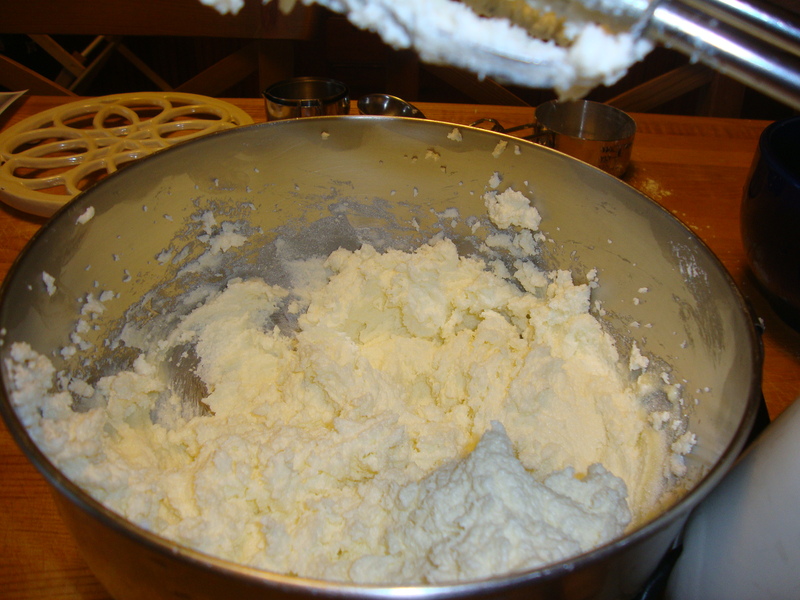 Beat butter at medium speed with an electric mixer until fluffy. Gradually add sugar, beating well. Add egg yolks, 1 at a time, beating until blended after each addition. 2. 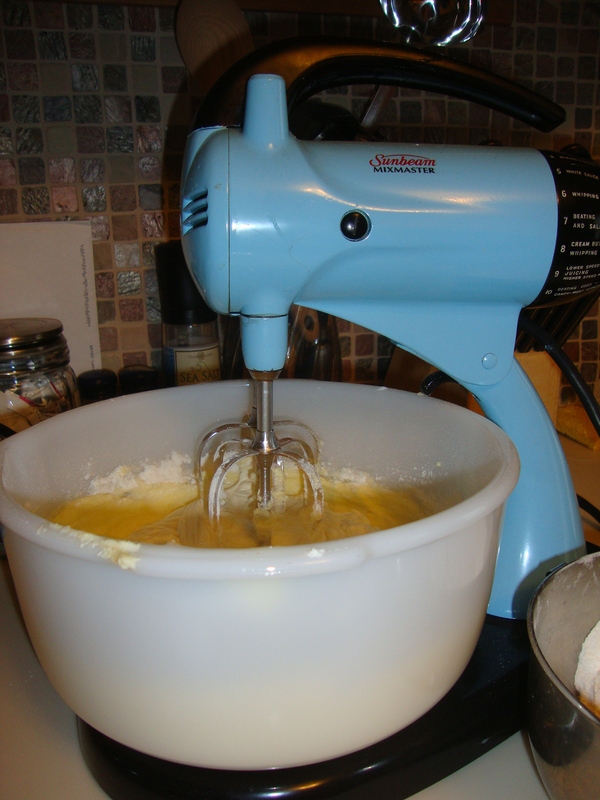 Combine flour and baking powder; add to the butter mixture alternately with milk (begin and end with flour mixture). Beat at a low speed until blended after each addition. Stir in the vanilla. 3. Preheat the oven to 350 degrees. 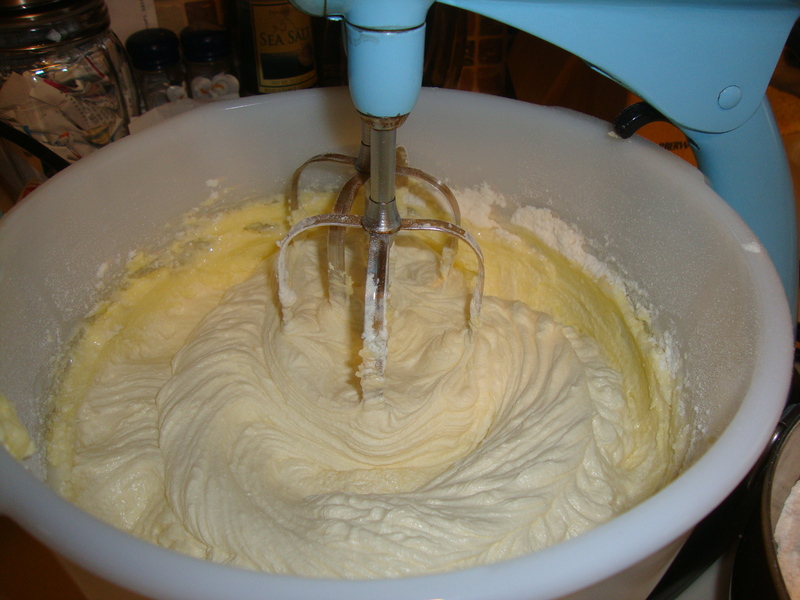 Beat egg whites at high speed with the electric mixer until stiff peaks form; fold 1/3 of the egg whites into the batter. 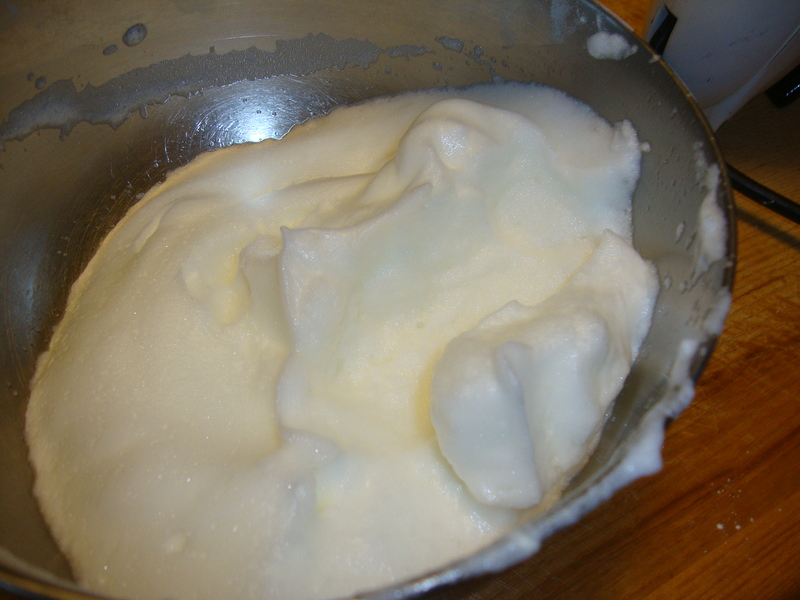 Then gently fold in the remaining beaten egg whites just until blended. 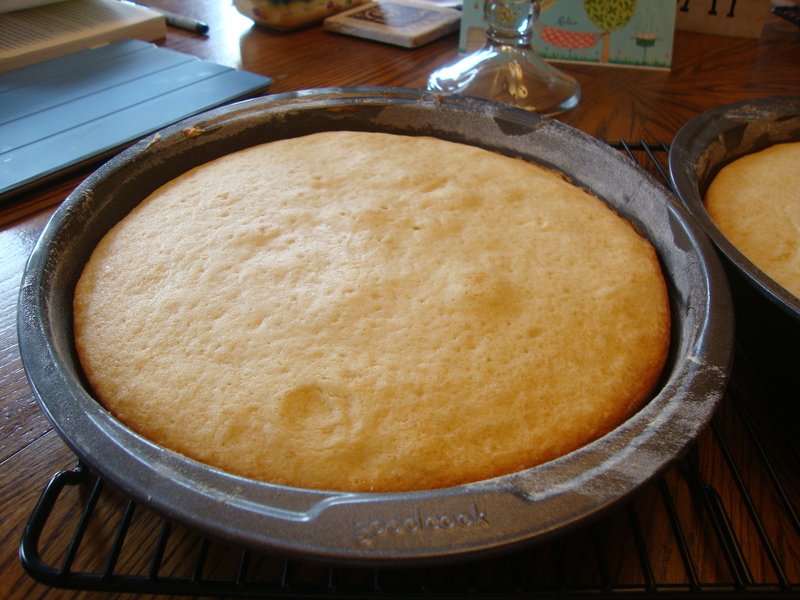 Spoon the batter into 3 greased and floured 9-inch round cake pans. 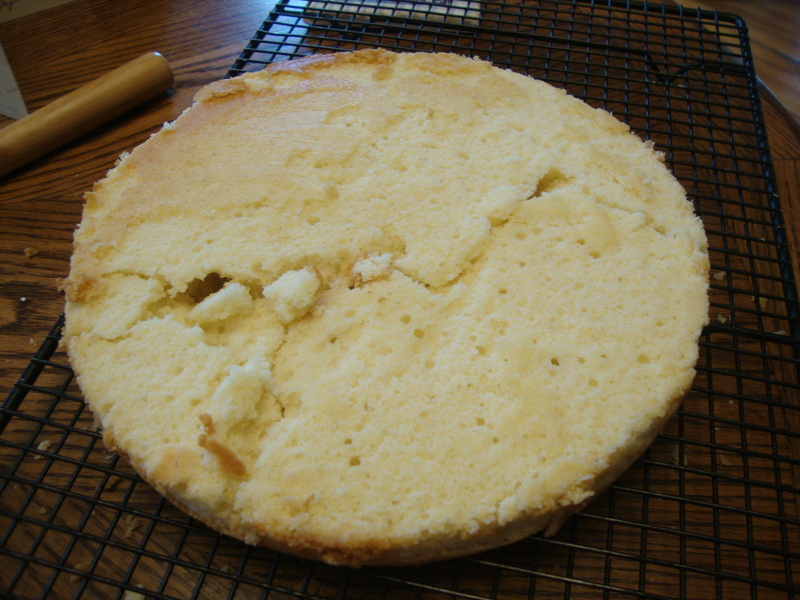 ADVICE: even with the greasing and flouring of my cake pan, one of my cakes broke in half. 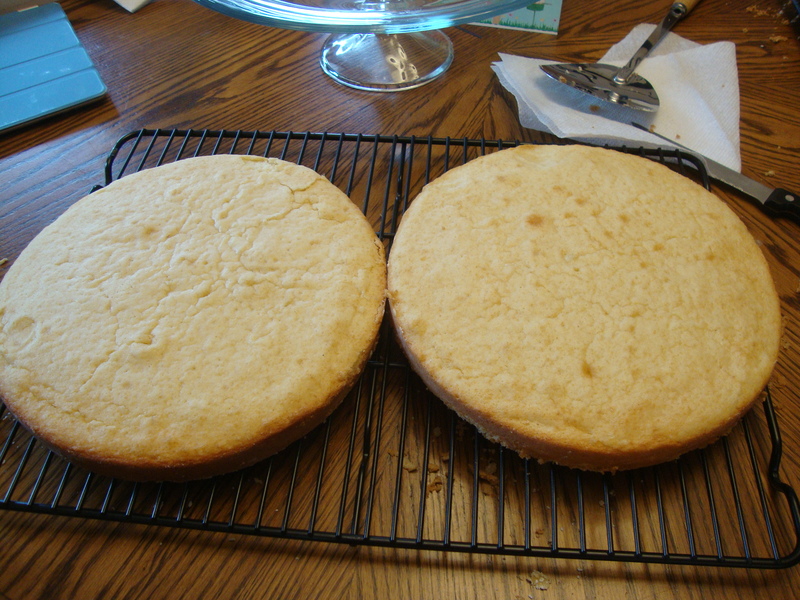 After further research I decided I should have cut 3 circles from parchment paper and placed them on the bottom of each cake pan to prevent this from happening. 4. Bake at 350 degrees for 18 to 20 minutes, or until a wooden toothpick inserted in the center comes out clean (I don’t know if something was wrong with my oven… but I needed to bake mine closer to 25-30 minutes to get a clean toothpick, so keep an eye on it). Cool in the pans on wire racks at least 10 minutes. Remove from pans and let the cakes cool completely on the wire racks. 5. 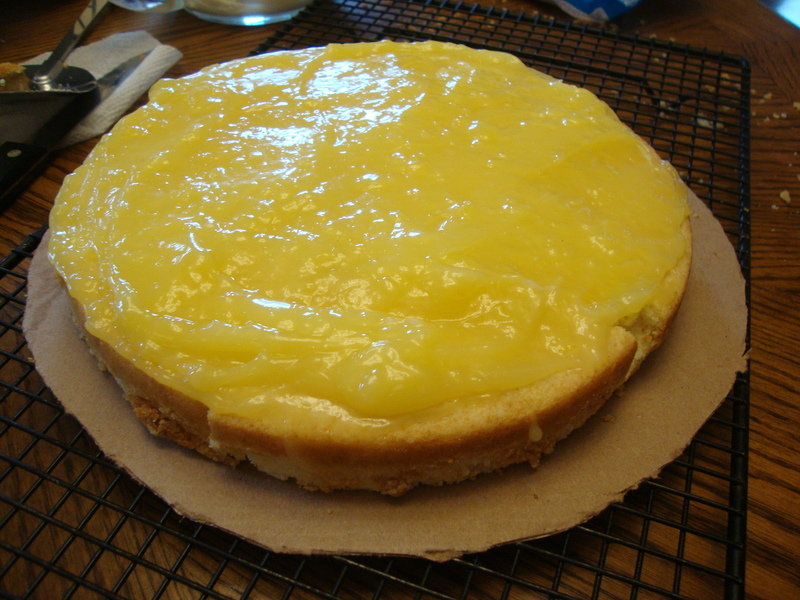 Prepare Lemon Filling: Combine sugar and cornstarch in a medium saucepan; whisk in 1 cup of boiling water. Cook over medium heat, whisking constantly until the sugar and cornstarch dissolve (about 2 minutes). 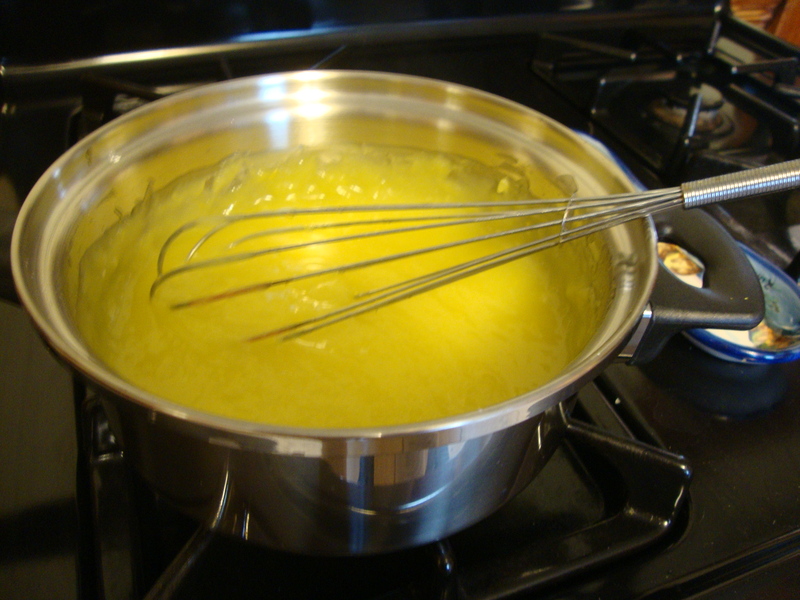 Gradually whisk about 1/4 of hot sugar mixture into your 4 egg yolks. Then add everything to the remaining hot sugar mixture in the pan, whisking constantly (you don’t want scrambled eggs!). Whisk in the lemon zest and juice. Cook, whisking constantly until the mixture is thickened (about 2-3 minutes). It will start to become gelatin-like. Remove from the heat. Whisk in the 2 Tbsp of butter and let cool completely, stirring occasionally. 6. 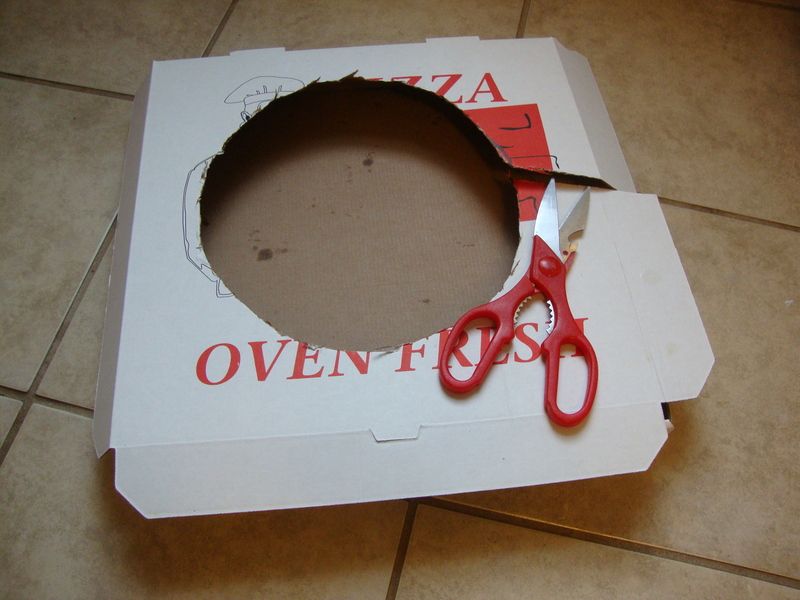 I cut a round piece of cardboard from a pizza box to set my cake on while it was being built. 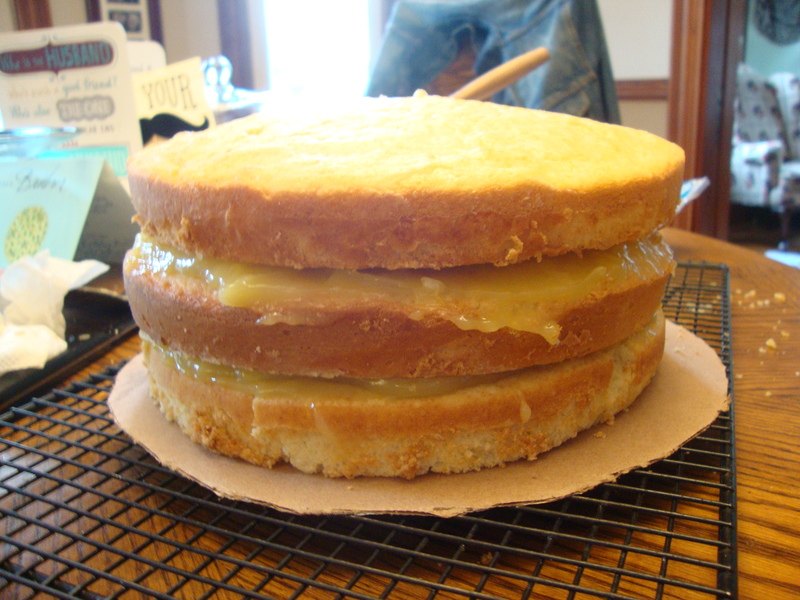 Spread the Lemon Filling between the layers of cake. 7. 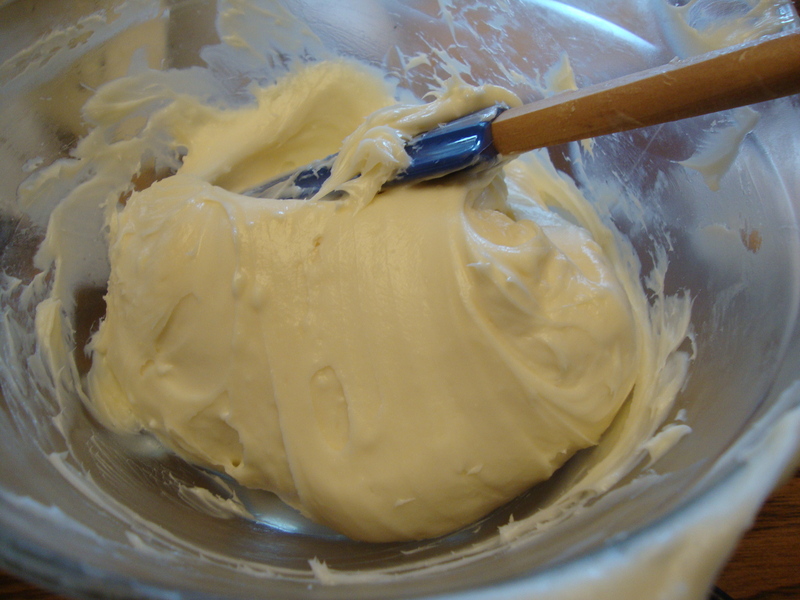 Prepare the Cream Cheese Frosting: Beat butter and cream cheese at medium speed with an electric mixer until creamy. Gradually add powdered sugar, beating at low speed until blended; stir in vanilla. If you want to double this part you can. The websites I looked at for help suggested doing one layer of frosting, refrigerating everything so it hardens, and then doing a 2nd layer so it’s nice and smooth. I definitely struggled on this part which seems like the easiest, but isn’t. Mine wasn’t “professional” looking, but it tasted delicious, so I didn’t really care. 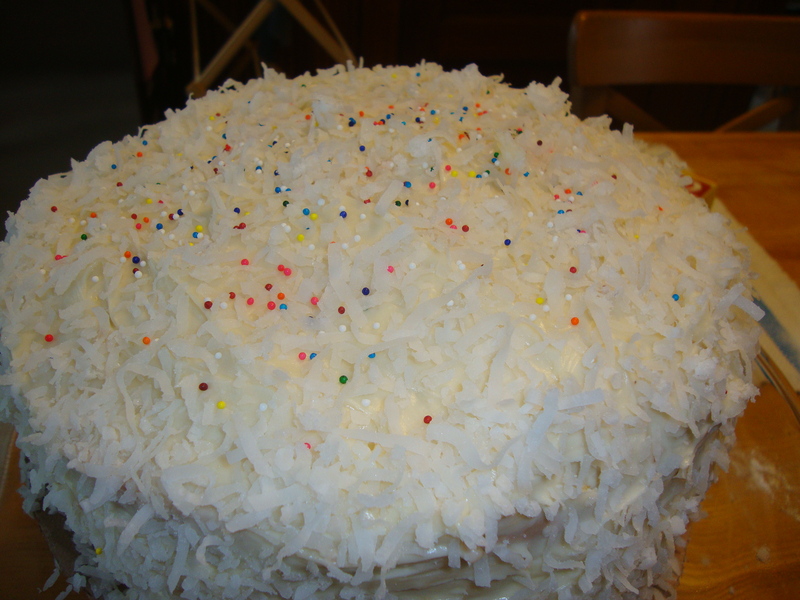 I didn’t have enough frosting to do one thin layer and then a second layer for smoothing. 8. 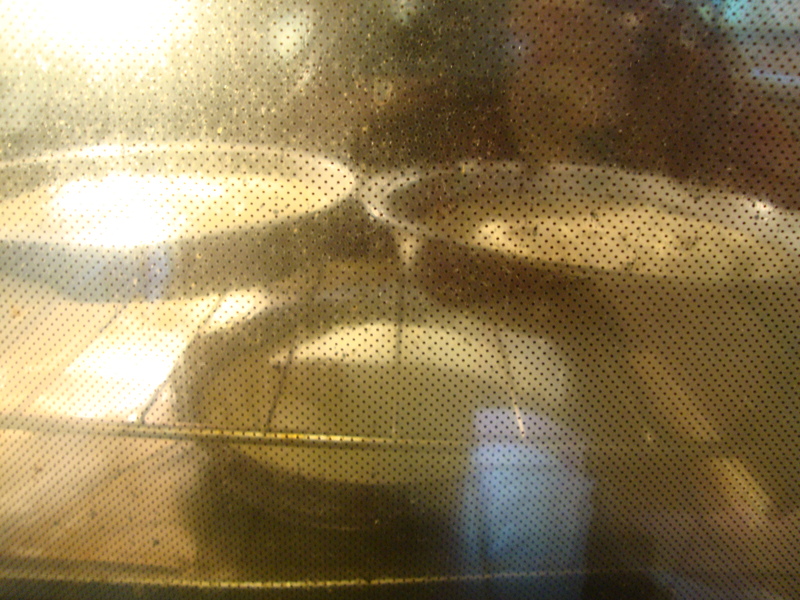 Spread frosting on top and sides of the cakes. 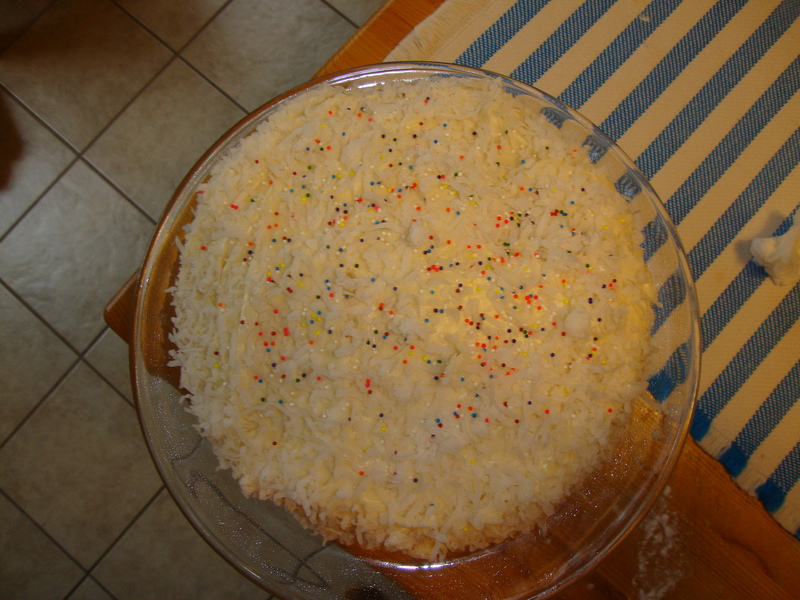 Sprinkle top and sides with the shredded coconut. Garnish if you like. Place on a pretty cake stand.